We are a family of alpine enthusiasts. You may have gathered that from my vertically slanted articles. 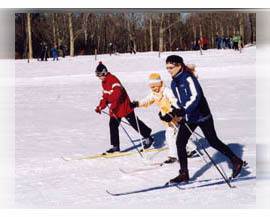 My son had been pestering me to try cross-country skiing for a few years. So on a cold, blustery Sunday (read: wind hold at Sugarloaf) we took to the lower elements and tried sliding horizontally, skinny skiing, for a change. Harris Farm in Dayton, Maine was our Nordic destination. 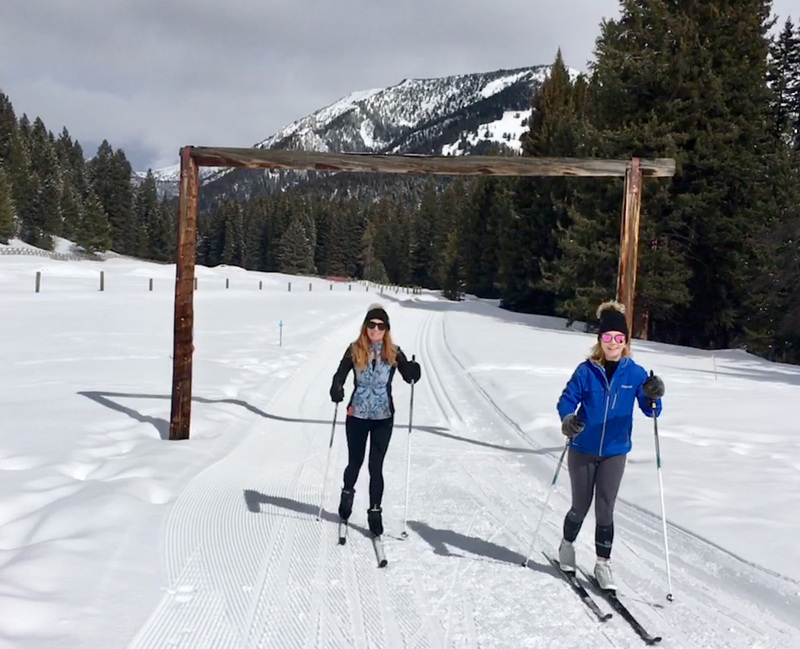 The family operated dairy and tree farm has been in the cross-country ski business for over two decades. Dixie Harris greeted us enthusiastically in the cozy warming hut and her staff quickly fitted all four of us with boots, skis and poles. Nordic ski lessons are available at Harris Farm, as well as a learn to ski package for $35 including rentals and a trail pass. We opted to go it alone, since we figured we could convert from Alpine to Nordic without much difficulty. My son said, “These skis are so much lighter and easier to carry than our downhill ski gear.” We placed the narrow boards in the snow, clicked our boot toe pieces into the bindings with an easy snap and we were ready to ski. My husband Greg had cross-country skied years ago, so with a few pointers he had us all sliding across a beautiful snow-covered field in moments. We came up on four women, all giggling, one said “This is my first time, my friends dragged me out here and I am a little wobbly.” The women were obviously having fun and the first timer was progressing quite well. As we skied away on Meadow Run, we could hear their laughter emanating through the woods. We free-healed our way along the well-groomed track. The thin skis slid efficiently within the set tracks. Some very experienced skate skiers charged past us on the widely groomed skating lane. 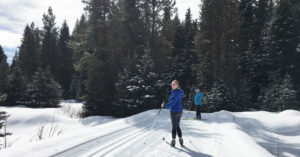 Like any sport, you can take Nordic to all levels, from a leisurely walk in the woods to skating aggressively, to backcountry. “Sugarloaf has a lot more difficult trails and backcountry Nordic,” said Karta Owens of York. We passed Owens and his family enjoying a thermos of hot cocoa on a trailside picnic bench in the woods. We skied over gentle rolling pastures, through quiet wooded paths, along babbling brooks and up and down modest hills over the course of the next few hours. Despite the cold temperatures and a brisk wind, we were warm and thankful that we had dressed in layers to unzip as our pace intensified. Trail passes at Harris Farm are $12 for adults, and $8 for students. Nordic centers maintain and groom their trails, plus provide signage and trail maps as part of the fee. But there are no lifts, which was a disappointment to my daughter when we came to our first big hill to climb. “They should put in a rope tow here, Mom,” she suggested. I reminded her that the reward for making it up would be a thrilling ski down on the other side. The modern scaled skis gripped the snow as we trudged up the hill, and the herringbone technique came into play in a few steeper spots. The descents were fun, even though we were sliding at a fraction of the speeds we attain when downhill skiing. Perhaps it was the sense of accomplishment for going up and down on our own steam, or maybe it was simply not falling at this new sport. 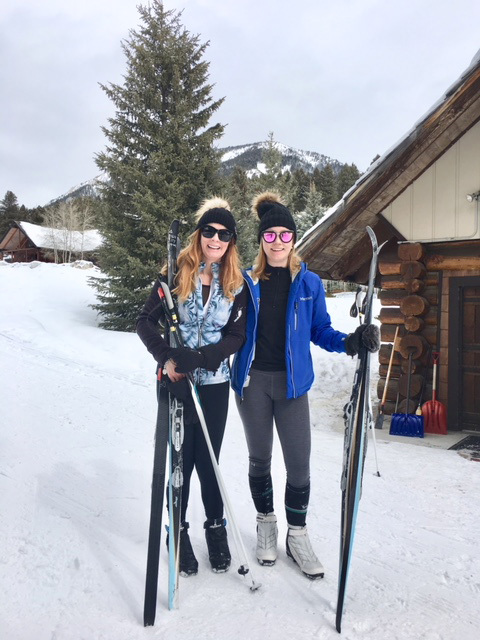 Everyone we encountered cross country skiing was smiling, enjoying the beautiful outdoors and relaxed enough to exchange hellos as part of this unhurried sport. And of all the new Nordic inductees we met, no one appeared frustrated or stressed by the activity. “If you can walk, you can pick up Nordic skiing,” said Jenny Freeman of Kittery. Freeman explained that in her 30 years of cross-country, the sport has become easier due to better grip and glide on the shorter skis, and better wax. After two hours on the groomed trails, we were well exercised, but not sore or cold. We are not hanging up our downhill boards and crossing over to cross-country. But our family is pleased to add skinny skiing to our winter outdoor repertoire. In fact, now my daughter wants to try ski-joring, since she thinks the sport can only be improved with a dog team to pull her up those hills.